Embedded styles are useful but if you want to style a whole site it is easier to have an external file with styles in it which apply to all pages. You did this in the introductory tutorial but here it is in more detail. The first line tells the browser what language you are using in the style sheet. Most of the time it will work without this but just include it in every style sheet to be sure. 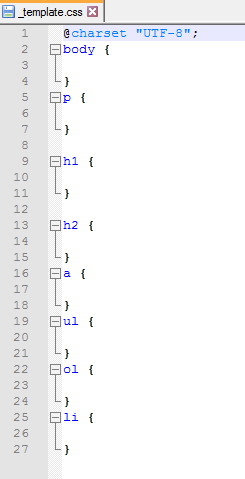 The other six lines make up two rule sets as you saw in your embedded style sheet. Each has just one rule. Now open embedded.html and save it as external.html. Save & view but you may realise nothing should change. This creates a link to the style sheet. The rel attribute is what relation the external resource has to the Web page. The type attribute tells the browser it is CSS written in a text format. The href is where the file is. The styles in the external style sheet are loaded but are then overridden by the embedded styles which appear underneath the link element. Move the link element below the style element. Save and view and you should see black and yellow. Now the embedded styles are loaded first so the external ones win. If this sounds confusing there is an easy solution. Just use one external style sheet and no embedded or inline styles. However, later you will find it easier to understand if you keep practising. An external style sheet is good because you are separating your HTML and your CSS. You can edit each one separately without getting confused by the mix of HTML and CSS (which do things very differently). It also allows you to style many (or all) pages on a site in one go. If you keep all your styles in the external style sheet you know where they are and can find them easily. No hunting through the HTML pages. It might be slightly harder and more complicated to set up external styles (you have to have two things open at once and set up the link element) but in general it is the best way. You should already have an HTML template with a link element pointing to a style sheet. It should look a bit like the screen shot when you are done. Save _template.css. You may not use all of those all the time but they will be there to remind you when you need them. Now you are ready to try a lot more styles.